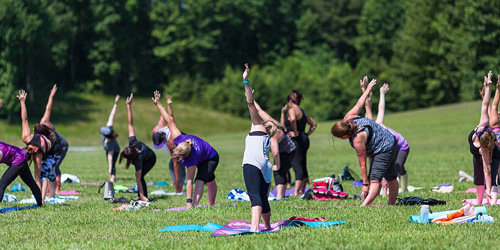 Kim Thompson is a Poquoson, VA based Vinyasa yoga teacher. Kim began practicing yoga in 2009 and has developed and nurtured a passion for the yoga lifestyle ever since. Eager to share this passion with the community, she received her 200 hour RYT (Registered Yoga Teacher certification with Yoga Alliance) from Zenya Yoga Academy in Newport News, VA in 2017. Kim specializes in Vinyasa style yoga classes suitable for all levels. Vinyasa is a style of yoga that dynamically flows through sequences of poses while linking breath with movement. By registering for this class, you agree to the waiver listed at the tab below. By registering for this class, you agree and understand that yoga includes physical movements as well as an opportunity for relaxation, stress re- education and relief of muscular tension. As is the case with any physical activity, the risk of injury, even serious or disabling, is always present and cannot be entirely eliminated. If I experience any pain or discomfort, I will listen to my body, adjust the posture and/or discontinue the activity and ask for support from the teacher. I will continue to breathe smoothly. I assume full responsibility for any and all damages, which may incur through participation. Yoga is not a substitute for medical attention, examination, diagnosis or treatment. Yoga is not recommended and is not safe under certain medical conditions. I affirm that I alone am responsible to decide whether to practice yoga and participation is at my own risk. I hereby agree to irrevocably release and waive any claims that I have now or hereafter may have against Kim Thompson and/or New Kent Winery.